The patented cutting mechanism provides the cleanest, sharpest, and the most effortless cutting action available. No-one ever forgets the "wow factor" the first time they use this unique, ergonomically designed cutting tool, as it slices and dices its way through line and webbing. 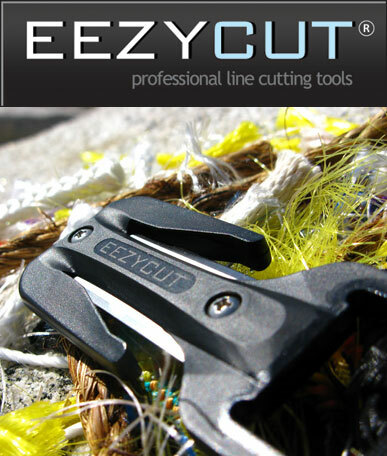 The EEZYCUT® TRILOBITE is rated to cut its way through line with ease, repeatedly, up to 8mm thick, and can easily cut through larger line should the diver need to do so in such extremely rare situations. 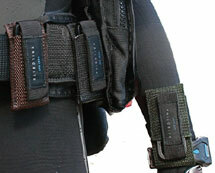 The EEZYCUT TRILOBITE also makes light work of all types of webbing. 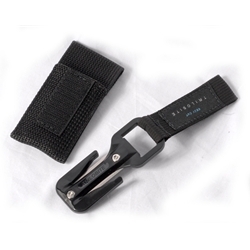 With cost effective replacement blades, this tool provides you with the sharpest cut in the water, every time. The ergonomically patented design uses a longer section of the cutting edge, prolonging the integrity of the blade by dispersing the erosion. As the line is pushed onto the blade by the frame of the tool, the cut is much more stable, which not only provides a much cleaner splice, but helps the blade retain it's edge. Other "closed" cutting tools have one pivotal stress point on the cutting surface which quickly corrodes and weakens. Normal "marine grade" stainless steel, in terms of diving knives, is generally the name given to 420 grade stainless steel, also known as, cutlery grade. Whilst it has a good corrosion capacity in water, it does not have such a good capacity to hold a sharp edge. Titanium can not create as sharp an edge as stainless steel. The grade of stainless steel used in the EEZYCUT TRILOBITE (440a) is known for it's capacity to hold an extremely sharp edge, whilst having very good corrosive qualities. When the blade loses its edge or starts to corrode, you can put a new blade in, and yet again have the sharpest, cleanest cut in the water. Washing in fresh water after diving is recommended for all stainless steel knives and blades. All stainless steel which is used in salt water, including open faced dive knives, need to be treated with care. Carefully coating any stainless steel blade in normal divers silicone grease prior to salt water usage significantly prolongs the life of the blade, and is recommended for the EEZYCUT TRILOBITE blades. The small, convenient size (93 mm x 36 mm x 8 mm / 3.66 inches x 1.42 inches x 0.32 inches) make it ideal to use as part of a divers options for redundancy. 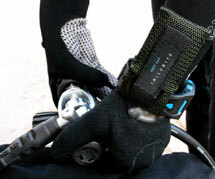 Divers should carry back-ups of all life support equipment, including the cutting tool, and the EEZYCUT TRILOBITE can fit easily into that inventory. This means that the diver does not have to ditch their open faced knife should they wish to keep it as part of their diving equipment.